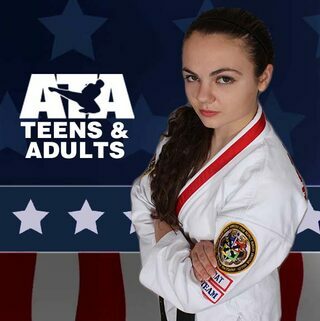 An official ATA Martial Arts Licensed School. Independently owned and operated by the Van Horn Family of Warrenton, MO. Located next to the Dollar Tree. Within walking distance of Warren County R-3 Daniel Boone Elementary and Black Hawk Middle School. We train Champions in the Art of Taekwondo! No soul or spirit is ever too young to start its own journey. Our fast paced 30 minute classes are designed to improve children's motor skills, enhance their ability to pay attention, and follow directions, and at the same time builds their confidence and courage to try new things. The taekwondo based curriculum provides students with the most fun and exciting training methods available for this age group. The program works in conjunction with other programs, thereby emphasizing the same important monthly themes and value system. 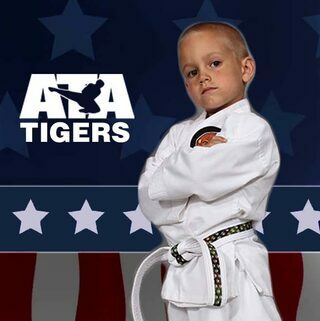 Upon graduation, ATA Tigers move into the "Junior" or "Big Kid" program. Respect, dedication, determination, and confidence--all are qualities that can help your child excel in the classroom plus at home. Our Taekwondo training is designed to be fun and fulfilling for each student. This is because Taekwondo is an individual activity rather than a team sport. Every student is active and valuable participant in class. Students work out with kids their own age and size under well supervised conditions, progressing at their own pace. Curriculum includes Taekwondo Techniques, Traditional Forms, Weapons, Sparring, Combat Sparring, Board Breaking, Self Defense, Life Skill Training and more. Whether you are in excellent physical condition, looking to lose weight and get back in shape, or just looking for something new, martial arts offers a variety of options for teens and adult men and women. High-intensity fitness: Focus on improving the power, strength, and speed of your body in a way that is both challenging and engaging. Martial arts utilizes all muscles of the body making it one of the most exciting ways to help get in and stay in shape. If you live in Warrenton, Turesdale, Pendleton, Innsbrook, Wright City, Jonesburg, Foristell, Hawk Point, Holstein, Hopewell, Pickney, Treloar, New Truxton, Truxton, Marthasville, High Hill, Cappeln, Prices Branch, Troy, Moscow Mills, Flint Hill, Wentzville, New Melle, Femme Osage, Old Alexandria, Dutzow, McKittrick, Hermann, Rhineland, Bridgeport, Case, Bellflower, New Florence, Gilmore, Josephville, Washington, Ethlyn, Lake St. Louis, Montgomery City, Danville, Mineola, or Wellsville, then you are close enough to train with us! Mr. Van Horn is a 3rd degree Black Belt and Internationally Certified ATA Instructor and Judge. He holds the 2013 World Championship Title in Forms and is the Silver Medalist in Weapons of the same year. He holds multiple State and District Championship Titles in Forms, Weapons, and Sparring. Mrs. Van Horn is a 3rd degree Black Belt, Internationally Certified ATA Instructor and Judge, and ATA Legacy Program Facilitator. She hold the 2012 World Championship Title in Weapons and is the Silver Medalist in Forms of the same year. She holds multiple State and District Championship Titles in Forms, Weapons, and Sparring. Faith Van Horn is a 3rd degree Black Belt and Level 2 Legacy Instructor Trainee. Miss Faith leads the ATA Tiger classes and enjoys competing when her busy high school schedule permits. She was on the Combat Weapons Sparring Team that won the World Championship against Korea in 2016, as well as a 2012 Silver Medalist and 2015 Bronze Medalist in the individual Combat Weapon Sparring World Championships. Ryan Van Horn is a 3rd degree Black Belt and Level 1 Legacy Instructor Trainee. He is actively competing and hoping to someday capture the much sought after ATA World Championship Title. He loves competition and prides himself on being a well rounded martial artist often competing in as many as 7 different events per tournament. Ryan holds multiple State and District Championship Titles and consistently ranks Top Ten in the World in forms, weapons, and sparring. He especially loves Extreme Martial Arts and pushing the limits of what is physically possible with his athletic flips, tricks, and fast spinning jump kicks. Tyler Van Horn is a 1st degree Black Belt. Tyler is actively competing and proud to be ranked in Top Ten in the World in Sparring for 2018. He is hoping to win a Triple Crown State Championship Title in Forms, Weapons, and Sparring this year. Look out Tyler is a head hunter and has scored the most 3 point jump kick head shots of all of the Van Horns. What makes Excel Martial Arts Different from other Taekwondo / Karate / Hapkido Schools? 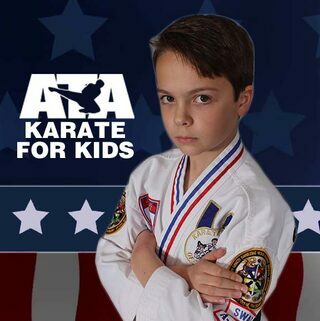 Our school is accredited by the country's largest martial arts organization, the ATA. 130,000 plus active members and over 1 million students trained since 1969. Each instructor has passed an intensive certification process based on 40 years of tradition, research, and development. Rank earned at our school is recognized and honored by more than 1200 other Martial Arts Schools in the U.S.
Only school in the Warren County area that can provide access to ATA's World Class Tournament Circuit. Training, Seminar, and Networking opportunities available with Elite World Renowned Martial Artists via ATA's vast industry connections. Taekwondo is a Korean Martial Art. The literal translation of Taekwondo means The Way of the Fist and Foot. Taekwondo was originally influenced heavily by Japanese Karate. Many Taekwondo Grandmasters used the term Karate when bringing their art to the U.S. realizing Taekwondo was a word unfamiliar to the average person. People continue to refer to Taekwondo generically as Karate, even though Taekwondo is an Art in its own right with its own theories, applications, and belt ranking system. Taekwondo is characterized by its its emphasis on head-height kicks, jumping and spinning kicks, and fast kicking techniques. Excel Martial Arts teaches Songahm Taekwondo. Hapkido is also a Korean Martial Art. The literal translation of Hapkido means "the way of coordinated power" or "the way of harmony". Hapkido is a highly eclectic Korean Martial Art in the sense that Hapkido borrows techniques from a wide variety of other martial arts. Taekwondo is different from Hapkido and the two Martial Arts have different testing requirements and a different color belt system even though some of the joint locks, pressure point strikes, and kicking techniques are found in both Taekwondo and Hapkido. In the late 80’s and early 90’s Taekwondo became the world’s most popular martial art practiced and still maintains an extremely high degree of popularity worldwide. Taekwondo has developed a very inclusive culture and belief that a Taekwondo Lifestyle can change the world and make it a better place. Taekwondo practitioners often enjoy friendly competition and many enjoy and admire the athleticism that is derived from a healthy tournament circuit. 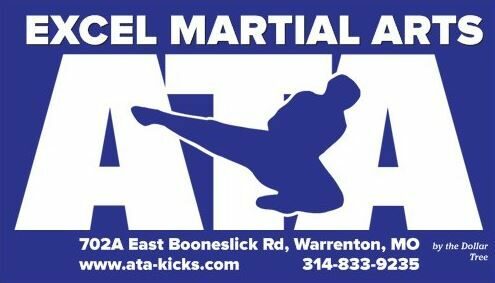 Excel Martial Arts is the only Martial Arts school in the Warren County area that provides access to ATA's World Class Tournament Circuit. For those looking for a chance to test their skills in a friendly and safe environment, there are opportunities to compete in Missouri, across the country, and even out of country. There is a HUGE Martial Arts community outside of Warrenton, and tournaments are a great way to get involved and see the bigger picture. Excel Martial Arts is Independently Owned and Operated business facility licensed by ATA International. 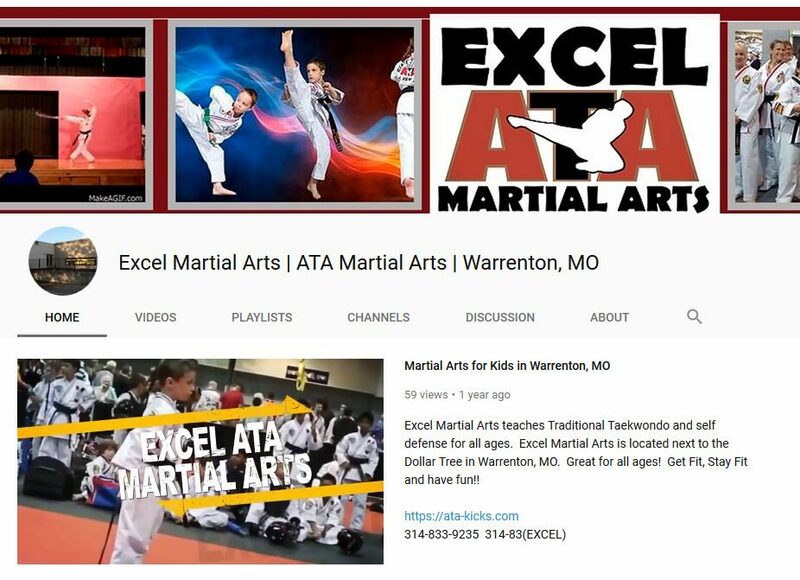 Excel Martial Arts is locally owned and operated by the Van Horn Family of Warrenton, MO. This page is not owned or or controlled by ATA International and any post only represents the views of the Licensed Business Owner.